Once you’ve wandered through enough cities in France, you begin to notice some similarities beyond cobblestone-lined quarters and fragrant boulangeries. Just as we do in the US, the French name their streets and schools after their most impressive men and women and many of them crop up over and over again. After meeting several of these “grands hommes” all around the country, I realized I didn’t actually know who many of them were or what they contributed to French history that makes them worthy of gracing so many public infrastructures. Know of a cool Frenchman/woman you think should be featured on Better Know a Frenchman? Leave a comment! Spotted: I first heard of M. Jaurès from both a boulevard and a school in Chambéry and a metro stop in Paris and Lyon. An article from France24 surmises: “Jaurès may be little known outside his homeland, but a glance at a map of any French town or city will reveal the extent of his impact on the country – thousands of streets, schools, metro stations and public squares are named after him. Perhaps only former president Charles de Gaulle has more French real estate dedicated to his memory.” And wikipedia adds: Numerous streets and plazas in France are named for Jaurès, especially in the south of France, as well as in Vienna (Austria), Plovdiv (Bulgaria), Tel Aviv and Haifa (Israel), Buenos Aires (Argentina) and also in Germany. Important Contributions: Jean Jaurès was one of France’s most popular political thinkers and a major anti-war voice at the start of WWI. He’s like the Ronald Reagan of socialism, in that his name has been invoked by politicians of all shapes and sizes for a hundred years: even the Front National uses Jaurès during election season. Leon Trotsky said he was one of socialism’s greatest orators. 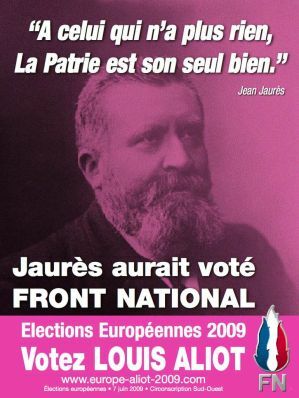 In 1902, Jaurès was a founding member of the French Socialist Party, which was eventually consolidated into the SFIO (French Section of the Workers’ International) an early forerunner of today’s Socialist Party. He was a founding editor of the socialist newspaper L’Humanite which is still in production today. Basically, the guy was really into socialism! He also authored the 1905 law on separation of church and state, which declared many Catholic church buildings property of the state and caused the closing of many Catholic schools. Jaurès played a role in the infamous Dreyfus affair, acting as a strong supporter of Dreyfus’s innocence. Antimilitarism and Assassination: One of Jaurès’ largest legacies is his outspoken attempts to de-escalate tensions across Europe in the early 20th century. In an iconic oration in front of 150,000 Parisians, he spoke out against the Loi des trois ans, which increased French military service terms from two to three years in order to prepare for a possible war. His pacifism drew criticism from nationalists like Raoul Villian, who in 1914, shot Jaurès in the head while he was dining at a Parisian café called Le Croissant which is maybe the most appropriate name for a café as ever there was. Two days later, Germany declared war on France, and the First World War exploded across Europe. Fun Fact: His full name was Auguste Marie Joseph Jean Léon Jaurès. François Hollande at Café du Croissant on the anniversary of Jaurès’s assassination. So true! I get confused in many French towns with the same street names. There is always a Charles de Gaulle or a Jean Jaurès poking around. Recently a group of feminists renamed the streets of Paris after important female figures to make a point that these women’s names are often missing! Previous PostMy Suitcase Can Only Weigh HOW MANY Pounds?! And other packing concerns.